We have been looking at each of Abrams squad’s efforts since their conception a little over a year or so ago. Not only is their banner magazine ten issues old now – there has been a special on the modern AFV the Fennek and the mighty Abrams M1 battle tank as well. I have seen this publisher growing smarter with their layouts and their quality of modellers used in the books seem to be always on the rise. Issue ten was burning in our hands enough of the talk, let’s have a look. This issue is seventy three pages and the softcover, portrait format magazine has a nice stiff glossy cover with pages full of step by step builds inside. It is not all builds as there are some advertisements. Not too many stoppages in play though, and the 9 Euro price point is the reason for the lack of advertisements compared to some other, better known magazines. Indeed the only problems with this series is that you have to look for a supplier close to you or get a subscription to ease the cost of transport. The former makes more sense to me. After an interesting question to modellers who like to build together by the editor we get straight into the “Commander’s Display Unit” - it’s a good thing to see some of Verlinden’s new items get a run alongside some other aftermarket goodies that look interesting from Macone Models and of course a short review of three mainstream injection moulded kits. You cannot go to deep in these sections but hopefully we will see them built on the magazine in the near future. In the next section “Remote Thermal Sight” (my favourite section of this magazine) we get to see a much more in depth review – Takom’s (Volkswagen) T3 van in 35th scale that sees the kit built up in all the major steps being shown along with several pictures of the real thing in a very similar angle to the constructed kit. I like it very much as you can see the shape and intricacies of each kit alongside the ultimate reference to check how good the kit is or is not. These are great building guides as well. Fist of the feature builds is a lovely but now ancient kit of the M2A2 Bradley from Operation Desert Storm. As the Editor was talking about, this is a model finished by two friends. Paco Arévalo builds and Jose Luís López paints this kit which really surprised me that there can be such a great job made out of such a basic kit of the Bradley. With all of the newer kits on the market from Meng and the like I would have thought this was in the too-hard basket. The impressive super detailing job by the builder was a perfect base for to add detail to, and the painter Jose Luís’ own Black and White technique real came out well with this AFV that features strong angles and facets in its construction. Next we see a pocket sized resin BMP-1 from Alex Clark. Although this is a relatively simple kit with not that many parts the problem of the kit being rather plain and monochrome is addressed as is the lack of detail. Alex shows what you can do with such a small kit. A historical setting is replicated next by Javier Soler. He replicates the vision of the end of the Vietnam war with his NVA TYPE 63 crashing through the gates to end that conflict. Although on the surface we are again looking at a monochrome vehicle. However in many step by step builds with numbers attached to them so you do not get too lost we see how to get the most out of this one colour. The hits keep coming with this kit. Just as you think Javier is finished he is applying a new layer to the build. The result is a varied shade of green that is rich in colour, faded, dirty and muddy all at the same time. The inclusion of the highly modified figures and how they were modded is excellent. “French Hell Fire” is next. In their build of a French 48 – AUF1 GCT the combination of two builders is again featured - Sebastien Viale and Pierrick Boudehen tackle this French mobile artillery piece in 1/35th scale. The impressive gun is simply the Meng kit with Fruilmodel tracks and it’s nice to see a very simple build that most of us could replicate without breaking the bank on aftermarket. The model is nicely built - (albeit surprisingly needing a lot of filler who would have thought?) and well painted with a fair layer of dust and fading in step by steps. Thoughtfully there is a good walk around of the AUF 1 in the pages straight afterwards. Next we turn Japanese with the JGSDF TYPE 90 Kyū-Maru Main Battle Tank which is built by Luciano Rodriguez. Luciano has improved the Tamiya Base kit without too much aftermarket but with only basic materials that most modellers might have to hand. Indeed some of the items he added were from the women’s section at the dollar shop! An interesting paint scheme and weathering sees a good quality finish here. 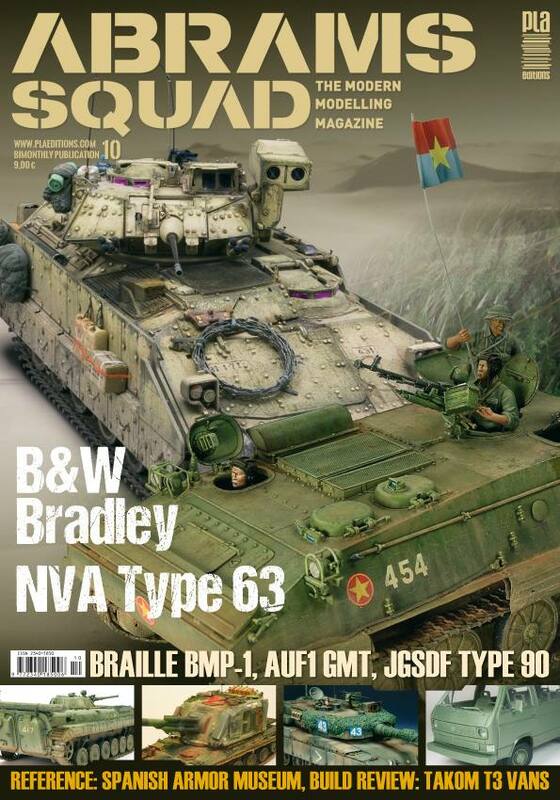 Lastly we look at the “Turret Basket” Upcoming kits and bits that we might see in future editions of the Abrams Squad Magazine. That’s the ten rounded up. The only fault I could find is some of the layout pictures and text were a little disjointed and a few of two of the writers need some help with their text. It is just a speedbump though as it is the quality of the models here that really shines. I like the collaborations shown in here and the spirit of the magazine.